Jacqueline Unanue has been selected in the Strokes of Genius Exhibition juried by Joey Mánlapaz. 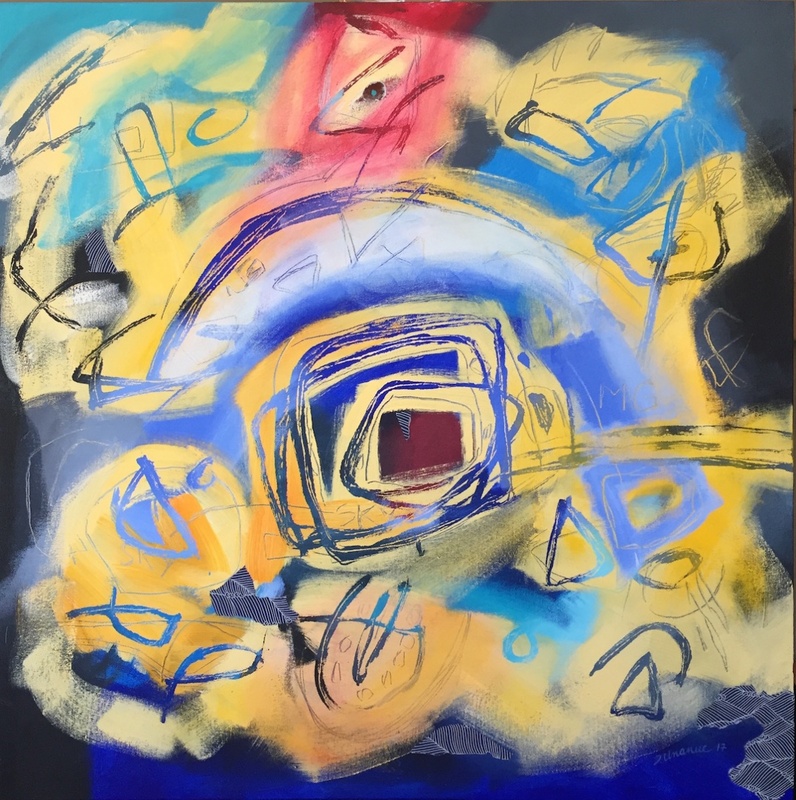 In this painting, Unanue has been working inspired by 3rdStreet Gallery fellow member Marjorie Grigonis, who recently passed away. Unanue always admired Grigonis' art, feeling a connection with her abstract and spontaneous painting. She was intrigued how she used her big surface yellow color, for that reason, Unanue titled her work: Yellow Sky, as one of the Marjorie’s artwork title. She painted using Marjorie’s inherited paintbrushes, while listening to her favorite jazz music of Miles Davis. In a very happy coincidence, Unanue found the Miles album titled: Miles in The Sky, matching with the spirit of her homage painting for MG.
Unanue studied design at the Universidad de Chile de Valparaíso, as well as training in drawing, painting, art history and textile art. While a student, she became interested in the rock art found in her native country. She traveled extensively through Chile’s Atacama Desert, doing on-site rock art research. She also traveled to Spain to study the pre-historic paintings of the Altamira caves in the Basque Country, which being the home of her paternal ancestors, connected her to her roots.